Among the dozens of supernumeraries who swarm the McCaw Hall stage at the end of Fidelio there are those new to Seattle Opera and to opera in general and also seasoned veterans of many operas. 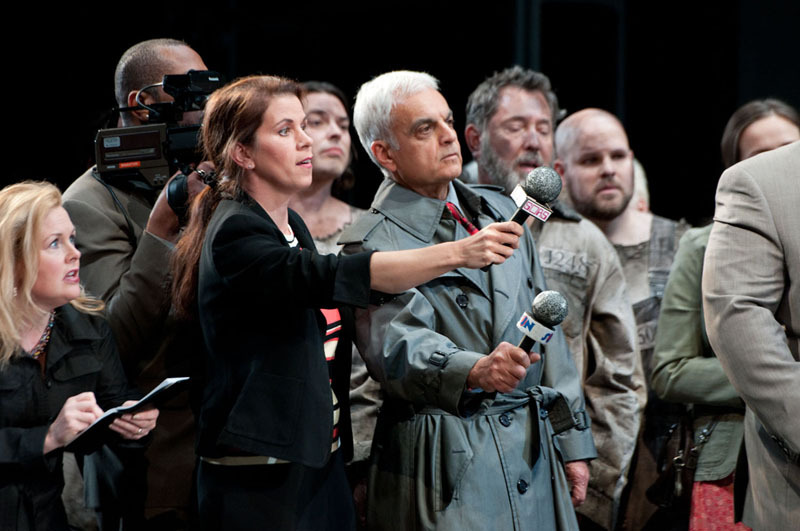 Today we speak with Robert Pillitteri, also known as “the TV reporter” because his well-dressed character interviews Don Fernando, the new Minister whose arrival brings about the deus ex machina conclusion to Fidelio. 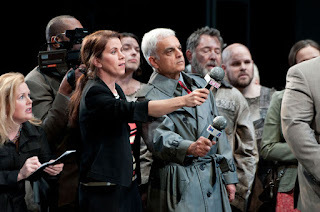 (Photo by Elise Bakketun, above, with Robert in trenchcoat in center; Fidelio supernumeraries Diane Abbey and Rosetta Greek, also seen in this photo, play reporters as well.) Robert has more than ten years of experience as a Seattle Opera supernumerary in a wide variety of operas—and he keeps coming back for more. Now, Robert, you were a supernumerary when this production of Fidelio was first created in 2003. What’s different now, from your point of view? In 2003 I was a TV reporter. 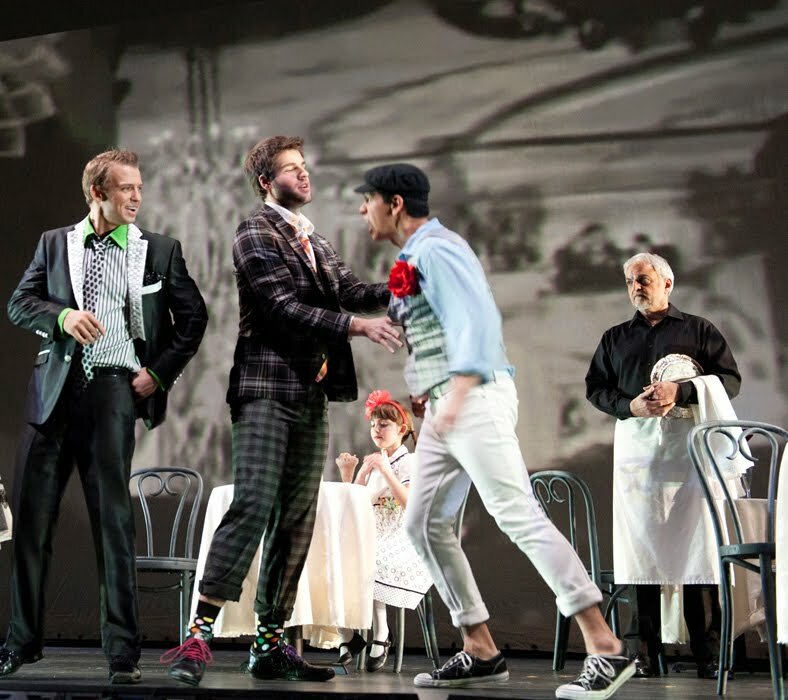 I appeared at the same time in the opera—in fact I’m wearing the same suit! But in that production, instead of interviewing Don Fernando, I was reporting on what had transpired. The camera was on me the whole time. In this production I am asking Don Fernando questions, and the camera is on him. Are you [and Kevin Short, who sings Don Fernando] actually saying words to each other? Do you try to crack him up? Be honest. [Chuckles] There are times, when we...yes. What is it you like the most about being a supernumerary? It’s a wonderful opportunity to be onstage with these fabulous singers and to hear the singing all around you. A very different experience from being even in the best seats in the house. You’re part of it. And it’s always fun to pretend to be somebody else! Were you an opera fan before you became a super? How did you first become an opera fan? One of those “This semester we gotta get through Romantic to Modern to Post-Modern” kind of things? On the first day, the professor said, “We’re supposed to study music from 1850 to the present day, but instead we’re going to study three operas.” And I said, “Oh, my God, my mother played it every Saturday from the Met, I hate it,” you know...but in a rare moment for me as a 21-year-old, I thought, maybe I’ll actually learn something, and I took the class and absolutely loved Rigoletto and Madama Butterfly. For some reason I didn’t like Don Giovanni at all, although today it is one of my favorites. I’ve now been onstage twice in Don Giovanni—as a waiter, both in the 2008 mainstage and the 2011 Young Artists production. Of all the roles you’ve played as a supernumerary, which has been the best experience? Without a doubt playing Buoso Donati, the dead guy in Gianni Schicchi. That was one of my favorite experiences in life! [laughs] It was for the 2008 Young Artists Program production, and the Young Artists were just terrific, I love being onstage and playing with them. I wasn’t your typical Gianni Schicchi dead body—Peter Kazaras decided to stage it like Weekend at Bernie’s, so I was alive at the top of the show and dropped dead watching a soccer game. Then I was onstage, not carted off, for the entire show, being tossed around like a sack of potatoes. I was bruised head to toe by the end of the run, but it was a great experience to be onstage with that wonderful singing going on all around me, that fantastic music—I just really, really loved it. A close second was Don Giovanni with the Young Artists, where I had to lip sync, for the sake of the stage picture. Is there an opera you’re hoping to do as a supernumerary? Yes, Rigoletto, which is my absolute favorite opera, and which I’ve never done. I can’t wait for it to be done again. All good things come to those who wait. Be patient, and we hope to see you onstage in lots more supernumerary roles!